I thanked God for the small miracles in Jude's new little healthy body. After much frustration in trying to get my 3 year-old to lay down and take “just a little nap” and many requests for me to rock him “just a little bit,” I gave in. Usually, his requests to rock are just a ploy to get out of bed and then he can’t seem to be quiet or hold still long enough to fall asleep or even grow drowsy. But I decided today I’d try again, just for the slight chance I’d get the opportunity to rock my big baby to sleep. And oh how glad I am that I did. I thanked God for the small miracles in Jude’s new little healthy body. Rocking Jude today gave me yet another opportunity to thank God for his grace and mercy in healing Jude and allowing us the opportunity to be his parents here on earth and to watch him grow. As I rocked him today, I studied each part of his growing body and thanked God for the small miracles in Jude’s new little healthy body. 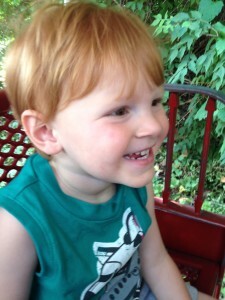 Thank you Lord for his beautiful, long red hair. He lived 2 years with very few frail and breaking strands of hair and I’m reminded of Jude’s healing every time one of our family tells me it’s time for a haircut. I’m still resisting because I love seeing his mess of beautiful hair to remind me of how healthy he has become this past year. Thank you Lord for preserving his brain and allowing him to develop and grow cognitively without any delays. Jude was very malnourished and dehydrated, especially the last 6 months before he was diagnosed. It’s amazing that he continued to develop normally in his speech, language, and cognitive development. Despite his physical fatigue and malnourishment, his brain remained quite well nourished. Thank you Lord that he can now breathe deep and easily. Our pediatrician told us he just had small nasal passages but I always suspected he was breathing a little too hard and fast. The tumor was large enough that it began to push everything upward and make it difficult for his lungs to fully expand. I’m sure this contributed to some of the fatigue he experienced. Thank you Lord for a smaller belly with a cute little innie belly button. Jude’s belly was always huge and bloated, full of air and contained very little food with a huge ugly tumor. He looked almost pregnant with his belly button sticking out. Thank you Lord for a perfectly healthy and fully functioning liver. Jude’s liver took a big hit, along with all his other abdominal organs, during the tumor removal surgery. His hepatic artery was lost in tumor and cut during surgery. A decision was finally made by Dr. St. Peter to try and preserve his correct anatomy and he called in a liver transplant surgeon to assist him in creating and redirecting a new hepatic artery. Although it has always shown slightly sluggish flow, they did a great job in preserving Jude’s liver and making right what the tumor had destroyed. Thank you Lord for new clothes. Jude wore the same size for two summers so I was so happy to buy new summer clothes this year. They must have held up through all the washing because I pulled them out for his little brother to wear this year. Jude’s still on the smaller side but I won’t be disappointed if he’s too little to play football. Thank you Lord for energy and hydration. I can’t imagine what he would have been like had he not had a tumor sucking away much of his energy because his fatigue was something we had a hard time pinpointing. It seemed as though he was just shy and clingy. He wanted to be held all the time, often asking to just be carried to the next room. He also drank tons of milk and water and wasn’t very resilient to the hot summer days. Jude and his little brother, Finn, are both VERY active little boys now. They must be forced to slow down and sleep and we are so happy to see Jude full of energy and independence now. Thank you Lord for clean rides in the car. I will spare you the details but I can’t tell you how many times I cleaned either vomit or diarrhea from the cracks of his car seat. EVERY SINGLE ride in the car he would vomit because the position of the car seat would cause the tumor to further push on his stomach and make him sick. I also tried to fill him full of food before we went anywhere because we assumed he had a horrible case of car sickness. That only made things worse of course. I finally figured it out and could often see through my rear view mirror the signs that he was about to get sick and could get a puke bucket to him quickly. Wow, I’m sure glad those days are over! Thank you Lord for fewer trips to Children’s Mercy with less tests and Dr. visits. I’d like to think he’s healing a little emotionally as our visits become fewer and further between. He has been very anxious at any mention of the Dr. or his scar (alligator bite as his daddy has named it). But in recent days he talks about being “all better” and he took an interest in a Dr. kit he got for Christmas that I had put away. He has been giving us numerous shots and we all have good looking ears and great sounding hearts. We’ll see how his next ultrasound and visit with the oncologist go in September. Jude is very outspoken so he’ll tell us exactly how he’s feeling about the whole thing. Thank you Lord for loving and generous family and friends. I can’t imagine our journey without the wonderful people who helped us carry the heavy burden of having a child diagnosed with cancer. They cried with us, helped us make the difficult decisions, gave us breaks, fed us, encouraged us, entertained us, and they were just there when we didn’t want to be alone. I’m still amazed at the love and generosity of our families and friends and most especially our parents and grandparents. 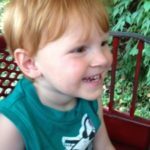 I hope medical professionals can all remember Jude’s story on the difficult days and know that without [their help] Jude would not be alive today. Thank you Lord for caring and talented doctors, nurses, respiratory therapists, pharmacists and social workers. I could go on and on about their time, talent, and devotion to helping children. We are especially grateful for Dr. Gamis for his years of helping kids and their families overcome cancer. His commitment through emotional exhaustion, his time away from his family, and his knowledge and research in finding the best possible treatment for each individual child. To Dr. St. Peter for his time and commitment in learning and training, time away from his family, and most specifically the mental and physical exhaustion he went through in Jude’s specific case to get the tumor out with as little damage as possible. To Dr. Almadhoun who took us seriously in our concern and dissatisfaction with Jude’s previous care. For his kindness and compassion for us during the complete panic we felt as we learned something was seriously wrong with our little boy. Because of him we were able to find what was wrecking Jude’s health and begin on the path to recovery. And for the nurses, therapists, and social workers for their care, compassion, and efforts to help each child have the best outcome possible. In my work as a nurse I have seen and participated in care for many children whose outcome was not what we were working so hard for. But I hope these professionals can all remember this story, Jude’s story, on the difficult days and know that without the care of the medical team and the interventions we were gifted with Jude would not be alive today. For this reason, we come back to work each week despite the mental and physical exhaustion. Jude and our family are so grateful for the many birthdays we get the pleasure of celebrating together due in large part to the great medical team he had. Thank you Lord for taking an interest in our little family. I’ve said it many times but there may be a chance we were just the lucky ones. That we just happened to have the “better” mutation that allowed for complete healing. But I don’t think so. I think God intervened on our behalf. And what does it hurt to give God the credit even if it was just by chance. I often feel guilty that we received the miraculous healing and there are so many other families suffering. Children who suffer with cancer make no sense at all to me. I long to see the day when all is made right. When children no longer suffer. So I hope that in our graciousness of what God has done for our family we can help to bring just a little more of that “rightness.” That we can help to do the work of God here and now until the day comes that all will be made right. I often tell myself to not forget how lucky we are or take for granted the great gift we have been given. I hope that as we continue to heal we can begin to help others going through the same trials we have faced. Please consider joining us in making the Kingdom come here and now. I think we can do it in small ways. It doesn’t take donating thousands of dollars for cancer research, although if you have it you should. But it also comes when we cry with someone, bring a meal, or buy a movie that provides distraction. These are just a few of the ways we saw God through our family and friends that helped make our difficult journey just a little easier to travel.